McGarrity & Moser has been a reliable name in the automotive industry for over 60 years. As a neighborhood auto mechanic, we enjoy making every transaction personal. We’ve always treated our customers like family, and plan to continue this tradition in the future. 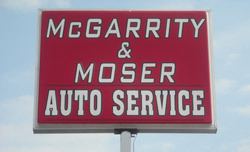 However, McGarrity & Moser combines this personal touch with high quality vehicle services. We perform auto repair on all types of vehicles, including imported and domestic manufacturers. We also supply priority diesel repair for work vehicles. Our technicians are skilled and experienced, and are also ASE certified. ASE is short for the National Institute of Automotive Service Excellence, and certification is only offered to a select number of professionals who have a few years of on the job training, a degree in automotive repair, and are able to pass a difficult written test. For more information, give us a call at (610) 446-5770.